The Bertie Project is the latest offering from Alexander McCall Smith’s Scotland Street series. I was in two minds whether to read this one or not despite the fact that I’ve read all the others but as I recall I didn’t enjoy the previous one so much, mainly because life for Bertie is moving so slowly – it’s not getting any faster. Bertie is still on a treadmill of his mother’s making such as – Italian conversazione lessons, yoga, weekly visits to a psychologist (it’s Irene his mother who needs those). Stuart, Bertie’s father is just about at the end of his tether. He has been completely emasculated by Irene who it transpires even made him walk down the aisle to her when they got married and insisted that Stuart promised to obey her. So when a chance meeting with a pleasant woman in Henderson’s vegetarian cafe leads to him realising that not all women are obnoxious like Irene – the inevitable happens and Stuart falls for her. Hallelujah! (I said anyway) and Stuart’s mother said something similar when she found out as it hasn’t been easy for her to watch her son being bossed and bullied by Irene. Honestly I thought Irene was going to get her comeuppance – but not for long. I suppose the ghastly Irene is just too good a character for McCall Smith to think of getting rid of her permanently – I live in hope of it though. Jack read the first Scotland Street book as it appeared in a ‘must read’ list of Scottish books, but he was less than impressed by it, mainly I think because it was so obviously meant for throwaway publication in a newspaper. You can read what he thought of it here. McCall Smith’s own attitudes are really beginning to annoy me though. He’s labeling Irene a fascist, well she’s definitely intolerant of anyone different from her, but she’s also apparently (shock horror) a Guardian reader, something that the author seems to despise. Also I’m a bit fed up that the only time he veers away from wealthy Edinbuggers as characters was to ‘slum’ it in Glasgow where the characters were criminals! I’m beginning to think that these books will be looked back on in years to come as being terrifically snobby, even more so than say Angela Thirkell’s books are nowadays. I suppose though he is just writing about the Edinburgh that he has experience of. An amendment on the inside flap of this book says: Oops! On page 1 of this book and elsewhere, the Turner Prize, as Bertie would be quick to point out to us, has been misprinted as the Turner Prise; no disrespect to the prize was intended. The problem is due to a computer error whereby words ending in – ize e.g. size or seize have been changed to -ise endings. Oops indeed, especially as there are quite a few mentions of Turner Prise due to the author having a bit of a bee in his bonnet about it. I read this one for 20 Books of Summer 2017 and the Read Scotland 2017 Challenge. The Revolving Door of Life by Alexander McCall Smith is the latest in his 44 Scotland Street series. I didn’t enjoy the previous one as much as I had some of the others, but this one was better I think. Bertie is still only seven years old, I reckon that that is the third book in which he is still seven. At the end of the previous book Bertie’s mother Irene has gone on a trip to the Persian Gulf and she has somehow ended up being taken captive in a sheik’s harem there. Irene is a very pushy and truly ghastly sort of female Edinbugger, a keen devotee of the child psychologist Melanie Kline and that has led to her trying her best to emasculate poor wee Bertie – perish the thought that he should want to do anything ‘boyish’ or even wear anything normal such as blue jeans. Bertie must wear pink dungarees. Her long suffering husband Stuart is enjoying the respite and fears that Irene will find her way back to Edinburgh all too soon. Meanwhile his mother has come to help him look after his two sons – Bertie and Ulysses. The lack of Irene is probably why I enjoyed this book more as she is so annoying. As ever there are moral decisions to be taken by many of the characters in the book. Such as – is it fair game to set up someone you know to be a gold-digger in order to rid your father of her attentions? Everybody makes the correct choices and everything is hunky dory – if only real life were like that! Bertie’s ambition is to move to Glasgow as soon as he legally can – and he thinks that is when he is 18, at this rate he’s never going to reach there which is a real shame because I would love it if McCall Smith continued the series in Glasgow at some point. I read this one for the Read Scotland 2016 Challenge, my 35th or possibly 36th. The Hangman’s Song by James Oswald is the third book in his Inspector McLean series. Edinburgh’s police headquarters is in chaos as the ongoing restructuring of Scotland’s police forces has meant that Chief Inspector Duguid – or Dagwood as he is sometimes known as is the temporary boss. McLean has a very low opinion of Duguid and the feeling is mutual. Duguid is piling lots of extra work onto McLean and at the same time is removing officers from his cases, sending them on needless training courses at Tulliallan police college. However when a series of hangings take place in the city there are enough odd details to make McLean feel that they are anything but the straightforward suicides that Duguid insists they are. McLean is having as much trouble with his work colleagues as he is with the investigation, jealousy is leading some of the more immature in the force to play stupid but expensive pranks on the financially independent McLean and at times he does wonder himself why he is bothering to remain in the police force. Luckily for us he realises that that would be giving in and doing just what his colleagues want. I’m really enjoying this series which should be read in order but I agree with Jack that it could do without the spooky elements which really don’t add anything. If you want to read what Jack thought about this book, have a look here. I read this one for the Read Scotland 2016 Challenge. At last I got around to reading The Book of Souls by James Oswald, it’s his second book and just as good as his first one I think. The setting is Edinburgh of course, where the Lothian police are struggling with a shortage of staff. It’s the run up to Christmas and an inmate at Peterhead prison has murdered the Christmas Killer aka Donald Anderson, a serial killer who killed ten women over a ten year period – all of the murders happening at Christmas. Just after Anderson’s burial copycat murders take place in and around Edinburgh, leading Detective Constable Tony McLean to wonder if Anderson was really murdered, or had he somehow duped everyone. As ever this is a well written book although as not many things in life are perfect, there were a few things which I could have done without. As in his first book there’s an element of spookiness in the shape of a demonic book, things like that just don’t appeal to me because demons don’t exist. I was surprised that there’s a Glaswegian hardman/gangster character who is almost a carbon copy of one who appears in Alexander McCall Smith’s Scotland Street series, even down to them both living in a rough council estate but having two semi- detached houses knocked into one. It could be a coincidence I suppose or maybe Oswald did it deliberately as a sort of homage – weirder things have happened. As a Glaswegian myself I do wonder why writers have to take themselves over to Glasgow when they want to find a hardman. They must exist in Edinburgh too and Dundee, Aberdeen and probably even in Auchtermuchty as well! Two books feature in the storyline, one is about the earlier serial killer, giving precise details of his crimes and the other is The Book of Souls, the demonic bit which I could have done without. Also I did notice that on page 53 there is a mistake in a character’s name – Peter Robertson’s name was morphed into Peterson, and for a minute I thought another character was being introduced. And if I’m really going to be nit-picking I did notice that there seemed to be people doing an awful lot of ‘errands’ which is a word which isn’t often used in Scotland ‘messages’ is more appropriate I think – well I told you I was nit-picking! I read this one as part of the Read Scotland 2014 challenge, it counts towards it as although Oswald is English, he does live in Fife where he runs a 350 acre livestock farm, raising pedigree Highland cattle and New Zealand Romney sheep. James Oswald has since been on Twitter (which I am not on) – saying that he was actually born in Scotland but went to school in England, which is presumably why he has an English accent – poor soul! Also he has never read anything by Alexander McCall Smith so the similarities with his Glasgow hardman are completely coincidental. I borrowed Standing in Another Man’s Grave from the library and I enjoyed it so much that I was sorry that I didn’t have any unread Rebus books in the house so that I could continue enjoying his company. The book was first published in 2012. Rebus has been forced into retirement but he really doesn’t have any other life outside the police and the pub, particularly Edinburgh’s Oxford Bar. So he has joined a cold case unit, technically a civilian unit but located within the Edinburgh Police HQ at Fettes Avenue. He would prefer to be doing his old job though and it looks like the cold case unit might even be closed down completely. There are parts of the job which he really enjoys, opening files and sifting through any evidence and old newspapers. Basically they need to solve a high profile case to make the high heidyins think the unit is worthwhile keeping going. Rebus ends up liasing with the police and working with his old colleague Siobhan Clarke again, a partnership which for me really works. The police might have thought he was past his use by date but he’s a better detective than any of the youngsters involved, they don’t even care about not contaminating murder scenes. I had a good idea of the way this story was going from about half way through but that didn’t spoil my reading experience. Rebus isn’t everybody’s cup of tea but he’s a favourite with me, I think a lot of the character is bound up with Ian Rankin’s personality too and this book was influenced by the fact that several of Ian Rankin’s friends had died around the time he was writing it. In fact he lost a close friend just 6 months or so ago – the author Iain Banks and this seems to have contributed to his decision to take a year off from writing. In yesterday’s Guardian Rankin wrote about Banks in the My Hero section, you can read it here. So we’ll have to wait longer than usual for his next book. Will Rebus be shelved once and for all or will he find his way back onto the police force? I do hope that we haven’t seen the last of him. I read this one for the Read Scotland 2014 Challenge, it was my 15th and I’ve already read the 16th, which was a children’s book by Mary Stewart, but more of that later. House-Bound was first published in 1942 but it has been reprinted by Persephone. It’s that World War 2 setting again, but this one is also set in Edinburgh which Winifred Peck decided to rename Castleburgh for some reason. It begins at a registry office for servants, but there are no servants to be found as they’ve all given up domestic drudgery in favour of earning more money, independence and ‘doing their bit’ for the war effort, and who could blame them! The middle class ladies of Edinburgh blame them, that’s for sure, but when Mrs Fairlaw (Rose) is told that millions of women do their own housework she decides that that is just what she will do. Rose has been born into quite a grand family and married Stuart Fairlaw who had inherited the family pile, Laws House, originally an ancient tower house but much enlarged over the years and very inconvenient and difficult to keep clean. Rose is completely clueless about housework and cooking and even wonders if you have to use soap to clean the potatoes! Stuart can see that his wife is exhausted by all her domestic duties but as a man it never occurs to him to lend a hand, and Rose doesn’t expect him to. Their children are grown up and off in various military services. This book is funny in parts but also sad too as the war takes a toll on family members. Rose is a strange mother/step mother with obvious favouritism towards one child and this has had an unfortunate effect on the rest of the family. Eventually a Mrs Childe comes to help Rose with the housework a few hours each day and she attempts to teach Rose the mysteries of domesticity, there’s so much of it going on that I felt quite exhausted. Did you know that you are supposed to clean your cornicing regularly, I didn’t – and don’t! It’s an enjoyable read and Rose is a really likeable character, there’s also some input from the US army in the shape of Major Hosmer, who tries to help Rose with her problems. One thing which did amuse me was the constant references to Rose and her friend Linda as being old and basically past it, so it’s a bit of a shock to realise that they’re only in their early 50s. I do believe myself that the 50s is the new 30s!! Often when I go into a library my mind goes completely blank and I find myself scanning the shelves hoping that something pops up or my brain gets into gear. 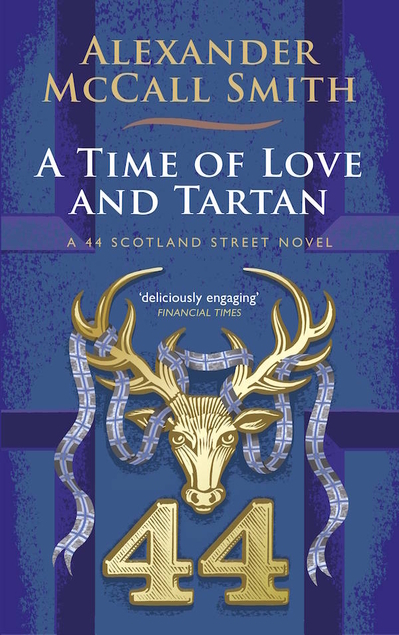 It doesn’t help when the place has just been completely re-organised as well, but I did think to myself – Alexander McCall Smith – it’s about time he had a new Scotland Street book out. Sure enough, there was one sitting on a shelf. Previously I’ve enjoyed this series, as much for the Edinburgh setting as anything else really but I think it is going downhill. It’s the usual cast of characters really, although Angus Lordie and his new wife Domenica don’t play much of a role as they take off for their honeymoon. Cyril the dog is the best part of the book, so there must be something going wrong with the series. For some reason Bertie is still 6 years old, and it’s mentioned quite a few times, he’s still wearing his crushed strawberry dungarees, much to his shame, in fact he seems to be unchanged, very strange considering how quickly children do change. His mother, Irene continues to be a pain in the neck, only relieved by another child’s mother getting the better of her. Bruce Anderson, another pain, hasn’t got his come-uppance, surely it must happen sometime, Matthew will certainly be hoping so! The author rambles off at times, often the best bits of the book as he comments on Thatcher and how awful she was and various ethical and religious musings, he gets a few things off his chest, like government statistics and the fact that not all Scots speak with a broad accent, but it doesn’t mean they are English. The trouble is that so many wealthy Scots still send their sons to Eton, a tradition which started when Scottish clan chiefs decided it would be a good idea to Anglicise their sons after the union. It is difficult to see people as Scots when they have an upper class English accent. Having said that, my own sons have been accused of being English, just because they don’t have a Fife accent. In the past I’ve enjoyed when McCall Smith shoehorns real Edinburgh characters into his books, but I did think OOPS! when Cardinal Keith O’Brien (he was the head of RCs in Britain) suddenly appeared briefly in the story, described as a very nice man. Obviously it was written pre his massive fall from grace. It is thought that Pope Benedict resigned after he discovered that O’Brien had had a long career of abusing young priests, who were completely under his control. So maybe it’s best to stick with fictional characters. I don’t know if I’ll bother reading the next book in this series, when it comes out. I didn’t hate this one, but it definitely misses the west of Scotland characters and humour, in the shape of the Glaswegian hard man Lard O’Connor, it was a mistake to kill him off. Of course it could be that I am just not in the mood for a Scotland Street book at the moment, and I am just being a grumpy old curmudgeon. At last I’ve got around to reading Knots and Crosses, the first in Rankin’s Rebus series which I’ve stupidly been reading all out of order. Laura recently gave me a copy of the book and I thought it would be a good idea to read it just after James Oswald’s Natural Causes, to compare their first police procedural forays. Set mainly in Edinburgh of course, where there have been abductions and subsequent murders of young schoolgirls. What do the girls have in common, what links them to the perpetrator, why is Rebus being sent bits of string in envelopes? I did enjoy this book which is mainly introducing Rebus to us and he is a character that I really like. On that score I did think it was a wee bit unbalanced as for me there was just a bit too much Rebus compared with the crimes and sleuthing. There were a few areas of the book which went ‘clunk’ on my ear and which I’m sure Ian Rankin would write differently now, but the first one of any series will inevitably be awkward compared with the following ones. All in all, I do think that James Oswald’s first book Natural Causes is better than Rankin’s first effort – so no pressure then for James! As I’ve been accompanying Rebus in his smoking, hard drinking and consequent hangovers I decided to give my liver and lungs a bit of a detox and opted to read a vintage crime by Patricia Wentworth next, a Miss Silver mystery, The Clock Struck Twelve. More on that soon. 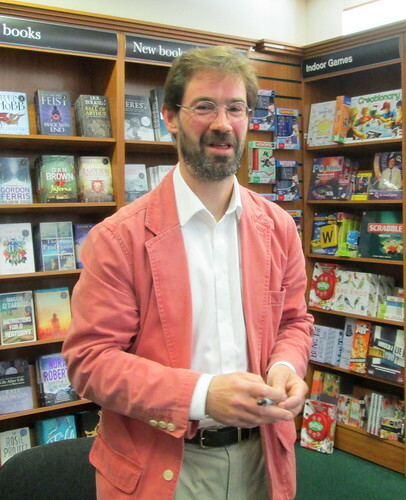 James Oswald originally self published Natural Causes as an ebook but after it became a huge success Penguin decided to publish it. Peggy Ann @ Peggy Ann’s Post has been championing his books for quite some time now, in fact I think it’s fair to say that she’s his biggest fan. But apart from that she’s also a very good judge of authors. James Oswald lives near St Andrews, just about 20 miles from where I live, so it’s quite bizarre that I first heard of him through Peggy, who must be about 5,000 miles away from here. I thoroughly enjoyed the book which is set in Edinburgh. Detective Inspector Tony McLean is such a likeable character, I’m looking forward to reading the other two books in the series which have been written so far, and hoping that there will be far more books in the future. McLean is an unusual member of the police force, he’s from a well-off background, brought up in a leafy part of the city, in an area of large stone built detached houses and walled gardens. Since the death of his parents when he was only four years old, McLean has been living with his grandmother and it’s near that neighbourhood that the first murder takes place. More murders follow, all very similar and the victims are well known in Edinburgh society. McLean has been given a cold case to investigate though, after the discovery of the body of a young woman in a sealed underground chamber in an old house. It’s thought she had been murdered about 60 years previously and during his investigations McLean begins to think that her murder is linked to the spate of present day murders. I can be a bit of a nit picker so on that note I did notice that early on in the book all women were described mainly by their hair – and there were an awful lot of redheads and ‘mops’ about. The only other thing that struck me was the name Anthony McLean – as my brother would say – ‘it disnae go’ or ‘it disnae rhyme’. In other words, they’re an unlikely combination of names, and I say that as a person with McLean as a middle name. Apart from that Tony is almost always a ‘bad’ name, usually a bit dodgy and McLean is anything but dodgy. Just ask any teacher about names if you don’t believe me. They always scan lists of new classes and there are certain names which will always ring alarm bells because nine times out of ten they mean trouble! For that reason I really hope that James Oswald is Jim or Jimmy or even Jamie to his friends! I’m sure he must be as he seemed like such a nice chap when I met him at a book signing in Kirkcaldy. 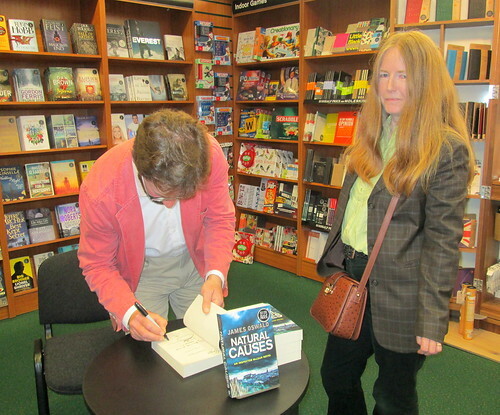 By popular demand I’m adding this photo of James/Jim and moi as he signs Peggy’s copy of the book in Waterstones and simultaneously proves that he has no bald spot, taken by Jack, who does have a bald spot. Just don’t describe my hair as a red mop, pair of curtains – maybe! I decided to read the first book in Ian Rankin’s Rebus series, just to compare the two writers, as James Oswald is being lauded as the new Rankin. I think that Oswald is better than Rankin was at the beginning of his writing career. I’m sure all authors look back on their early work and have a bit of a shudder to themselves though.